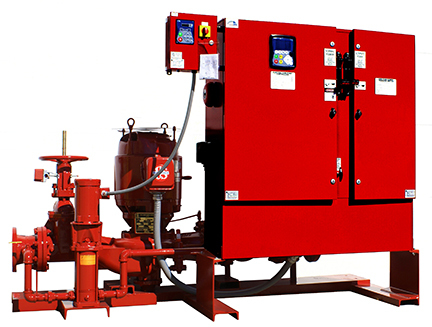 AC Fire Pump offers preconfigured options for packaged fire pump systems utilizing the 1580 series in-line fire pump. Designed with space-savings in mind to make retro fits and new installations as simple as possible while maintaining access to all valves. Standard available options include: Jockey Pump, Bypass Loop, Flowmeter loop, Controller on skid, and reverse orientation. Fire pump and jockey pump motors are prewired to their controllers. The complete system is ETL listed for compliance with NFPA 20.